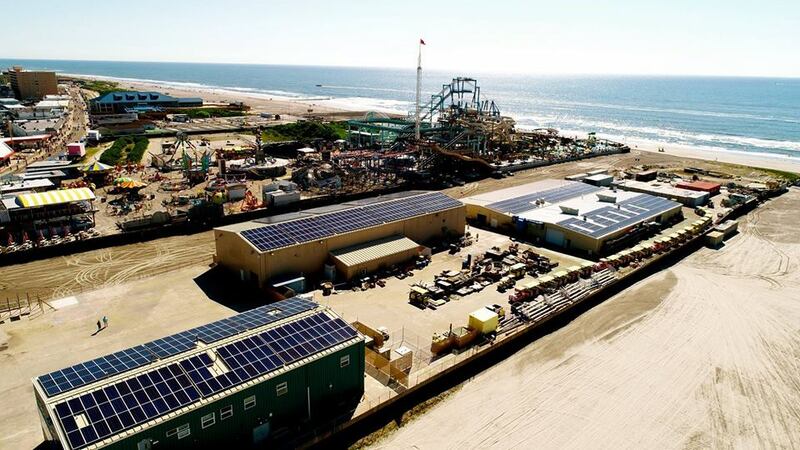 The Wildwoods, NJ – October 3, 2018 - Morey’s Piers today flipped the switch to power 36,300 square feet of maintenance buildings solely through 900-plus recently installed solar panels. The installation of solar power signifies the Morey organization’s continued commitment to improve sustainability and conservation on its three piers. The 901 P17 345-watt panels are installed on the four maintenance buildings located on Hunts Pier at 2710 Boardwalk. “We take our stewardship of this mile of pristine beach we enjoy so much very seriously, and the six-figure investment in this solar panel project was the right thing to do this year, no doubt,” said Jack Morey, second-generation owner. With a combined weight of 21 tons, the panels have been fitted onto the roofs of four maintenance buildings. Used year-round by a staff of 57 in season, the buildings house workshops for repairs, tests, painting, carpentry, and updates of all components of the rides and facilities throughout the three piers. Jack Morey noted that the solar project complements the company’s environmental conservation and sustainability programs that include use of biodegradable products system-wide, recyclable plastics and reduced Styrofoam usage, along with energy-efficient lighting throughout, and a proactive recycling system with 30.82 tons of material recycled in 2017. Morey’s Piers is in the planning stages of undertaking additional efficiency usage studies to identify other areas to save both energy and waste. After 10 years in solar installations, Geoscape Solar has grown into an industry leader in New Jersey. With local offices in Mount Laurel, Cape May and Florham Park, Geoscape Solar installs and helps finance solar energy systems for commercial properties, non-profit organizations and residential homes. Trusted for over a decade to design innovative systems that yield maximum output, Geoscape also offers creative financing options and deliver top quality installations. Named Sun Power's Top Commercial Regional Producer for 2017 and consistently making Solar Power World’s List of Top 500 Solar Companies. For more information, visit www.GeoscapeSolar.com call 1-877-GEOSUN-1 or like us on Facebook.